Elimination of hepatitis C among people who inject drugs in Europe will require simultaneous scale-up of direct-acting antiviral treatment, needle and syringe programmes and opioid substitution therapy, and a re-think of attitudes to drug policy and harm reduction in Central Europe, according to a modelling study led by researchers from the University of Bristol. The study findings, published in advance online by the Journal of Hepatology, show that although increasing the number of people treated for hepatitis C may result in large reductions in prevalence in countries with low hepatitis C virus (HCV) prevalence, it will have little impact on new infections in most settings. In the European Union, 3.6 million people were estimated to have chronic HCV infection in 2016. Estimates of the number of people with hepatitis C who inject drugs are difficult to arrive at, due to lack of surveillance systems, lack of information about possible sources of exposure and uncertainty about the size of the current injecting population in European countries. The modelling study found that in most European settings, hepatitis C prevalence would fall by less than five per cent at current rates of treatment uptake among people who inject drugs. Treating five per cent of people who inject drugs each year would achieve a 99% reduction in prevalence in the Czech Republic and Slovenia, but a large reduction in prevalence would only come about in other countries if the coverage of opioid substitution therapy and needle and syringe programmes reached 80%. To achieve greater treatment coverage among people who inject drugs, improvements in screening will be needed to identify people with hepatitis C. A systematic review also published this month shows that prevalence is high in many countries among people who inject drugs and among prisoners. Systematic screening for prisoners and engagement in care, and provision of hepatitis C screening and treatment in accessible places for people who inject drugs, are two of the ways in which screening might be improved, say the authors. Several other innovative methods of harm reduction could have an impact on HCV transmission among people who inject drugs and in prisons. In Canada, federal prison authorities are considering the introduction of a needle and syringe programme for prisons, and also the provision of safe tattooing facilities, to reduce hepatitis C transmission. Needle and syringe programmes in prisons are still rare; Harm Reduction International found that only eight countries – including Germany, Spain and Switzerland – provided clean needles and syringes to inmates in 2016. Several cities in North America are pioneering the introduction of safe injecting sites, where people who inject drugs can go to inject drugs using sterile injecting equipment, with overdose treatment close at hand. These facilities offer a good way of engaging people who inject drugs in other harm reduction services, such as opioid substitution therapy, and can offer screening for hepatitis C too. One of the most important harm reduction interventions, opioid substitution therapy, is still not widely available in many countries and is strongly rejected as a harm reduction measure by governments and experts in some of the Eastern European countries with the highest prevalence of hepatitis C. Ukraine, however, is expanding its opioid substitution therapy programme and is now providing treatment to over 10,000 people. A recent Cochrane Collaboration systematic review found that opioid substitution therapy reduced the risk of HCV acquisition by 50% among people who inject drugs, while high coverage of opioid substitution therapy and needle and syringe programmes reduced the risk of HCV acquisition by 75%. The number of people starting direct-acting antiviral treatment in Australia has fallen from around 4000 per month to around 1500 per month, according to Hepatitis Australia. 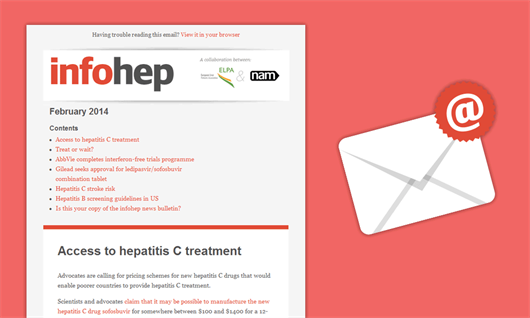 The patient group says that not enough is being done to encourage people to test for hepatitis C. In particular, the group says that general practitioners have a critical role to play in identifying people who ought to be tested. Elevated liver enzymes should prompt a test for hepatitis C in all patients. Australia’s federal government is funding efforts to treat and cure as many people with hepatitis C as possible by 2020, taking advantage of large discounts in direct-acting antiviral prices and an agreement with pharmaceutical companies to spend AUS$1 billion on drugs by 2020, but with no restriction on the number of people treated during that period. Approximately 43,000 people had been treated by June 2017 but another 200,000 people are either unaware of new treatments or discouraged from seeking treatment by the stigma surrounding hepatitis C. Approximately 75% of people with hepatitis C in Australia are estimated to be diagnosed already. Eliminating hepatitis C in Australia will require much more intensive efforts to promote hepatitis C treatment. Georgia, one of the smaller countries in Central Asia, has already been able to treat 45,000 people for hepatitis C and 98% have been cured, the head of Georgia’s National Center for Disease Control and Public Health announced last month. Georgia is providing free treatment for hepatitis C with the aim of eliminating hepatitis C by 2020. Gilead is providing sofosbuvir/ledipasvir (Harvoni) free of charge to demonstrate the potential for hepatitis C elimination in a middle-income country with high prevalence, strong political commitment and robust healthcare infrastructure. Liver fibrosis improves significantly in the majority of people treated for hepatitis C, including those with advanced fibrosis. A recently published study carried out in Sweden shows that even among people with advanced fibrosis or cirrhosis prior to treatment, fibrosis diminished in three-quarters of people cured of hepatitis C. But, fibrosis was less likely to improve in people with cirrhosis, in those aged 55 and over, and in people who were overweight. The study looked at 269 people cured of hepatitis C with either interferon-based or interferon-free regimens and followed for a median of 7 years after achieving sustained virologic response (SVR). Post-treatment fibrosis stage was determined by Fibroscan measurement of liver stiffness. The majority (87%) of people with advanced fibrosis pre-treatment experienced an improvement in liver stiffness after SVR. Similarly, liver stiffness improved after SVR in 83% of individuals with pre-treatment cirrhosis. Liver stiffness appeared to diminish over time in those with pre-treatment cirrhosis; whereas 48% of those with less than five years of follow-up still had a liver stiffness measurement above 9.5 kPA, only one-fifth (21%) of those followed for ten years or more still had a liver stiffness measurement above this level. People with hepatitis C in the United States are at least three times more likely to smoke than the general population but little is being done to help them stop smoking, and US researchers say that public health investment in hepatitis C treatment is undermined if patients are not helped to stop smoking. The authors point out that between 2006 and 2010, deaths due to cardiovascular disease, respiratory disease and non-hepatic cancers – all linked to tobacco use – exceeded those from liver-related causes among people with hepatitis C in the United States. They note that black race, lower socioeconomic status, psychiatric illness and lower educational attainment are associated with greater difficulty in quitting smoking, suggesting that smokers with hepatitis C are likely to need more intensive and prolonged interventions to help them stop smoking.